Download English Hand Book Here! 下载中文版本的说明书! Anyone who wants to monitor a valuable item into a well, or off a dock, or overboard will immediatly understand the signifigance of our YVVL-KS-25A Underwater Camera. This high quality tool allows easy monitor of underwater items, without the requirement for you to get wet or hire an underwater diver. It works equally well under ice and most weather conditions. 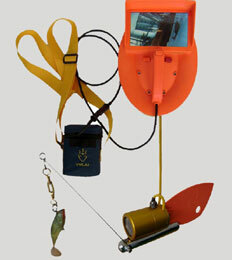 It is a well designed and durably built addition to any Yacht or Marine tool inventory. 1. Monitoring items from 30 to 100 meters underwater. Monitoring very small items (watches, phones, keys and purses) to very large items (bicycles, pets and people) up to 80KGs in manual mode or up to a whopping 200kgs with winch assist. Put a stainless steel rod for the underwater robot just with camera, there is a hook on the end of the rod. Then you can put lure on it and can see from the LCD how the fish approach and get it! Fish for Crab, Shellfish etc. 3. Remotely exploring the sea bed, lake or river bottom. b. Assist in freeing fouled Anchors and lines. c. Virtually any underwater exploration. Visually explore everything from the water surface down to the sea or lake bottom in vivid living color. Truly learn about the beautiful coral, different kinds of fishes and plant life in Inner space! The camera system is widely applied to aquaculture / underwater prospecting / underwater acceptance engineering / underwater activities / underwater scientific research / diving expedition / deep sea archaeology / salvaging / catching / deep well relief / fishing and enjoy under the deep sea or freshwater / fishing / yacht maintenance and etc. Products can monitor from a depth of 30 to 100 meter underwater, incorporating night vision with high definition and user-friendly CCD liquid –crystal video display and water proof control switches. Menus Show: OSD key with many languages. Battery: Efficient 4.5AH battery / 8 hour monitor use and water proof motor. HD Monitor: 7in 800x480px protected with tempered glass. Thanks for Choosing Southern Star Products!